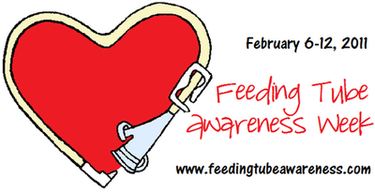 Our First Annual Feeding Tube Awareness Week® was a resounding success! Our first Awareness Week video included more than 70 children who are tube fed and focused on the medical reasons for tube feeding. It was viewed thousands of times on YouTube and Facebook. Feeding Tube Awareness Week® (February 6-12, 2011) was a viral campaign meant to raise awareness, dispel feeding tube myths and promote positive understanding among family, friends and the general public. More than 1,400 people participated with several parents getting media coverage. Feb 6 (Sunday) - Video launch -- The video will focus on building awareness that there are medical reasons for tube feeding. The goal is for as many people to see the video as possible. If you have made or are making your own video, that is great! TOPIC: Why does your child have a feeding tube? TOPIC: What is the most positive benefit your child has received because of tube feeding? TOPIC: What do you want people to know about tube feeding? TOPIC: How would you like to raise awareness of tube feeding? TOPIC: GO AHEAD AND ASK ME! What do you want to know about tube feeding that you have been afraid or uncomfortable asking? TOPIC: Describe a negative experience you encountered because of tube feeding and explain how it could have been more positive. What should have happened?